Red jalapenos, I was introduced to this after coming to Singapore. Though i have seen this in the vegetable section i never picked this as i don’t have any idea of what to make with this red jalapeno. 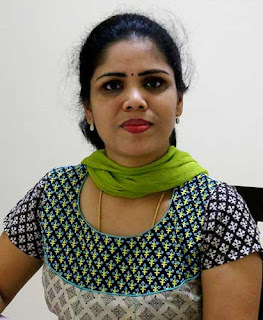 One day when my friend told that she told made chutney with red jalapenos and she gave me some to taste also. 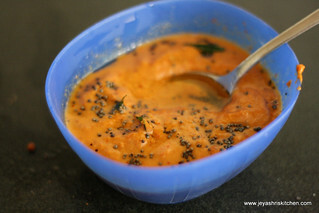 As the taste and the recipe sounded nice , i made it on the next week and had with Idli. Red jalapenos can be replaced with a red bell pepper too. 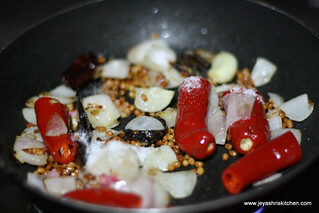 In a pan add oil and throw in the urad dal, red chilli, roughly chopped onion and roughly chopped jalapenos. Saute till the dal turns golden brown, saute in a medium flame. Switch off the flame and add tamarind and salt. Allow this to cool . 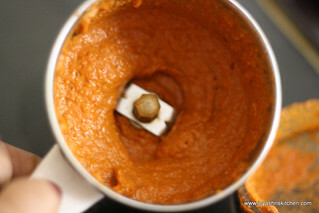 When it is completely cool, grind it ina mixer into a smooth paste by adding little water while grinding. Transfer it to a bowl and temper with mustard seeds and curry leaves. 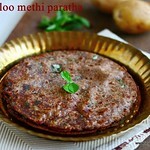 Serve with hot idlis| dosa.. Even this will taste nice with chapathis too. 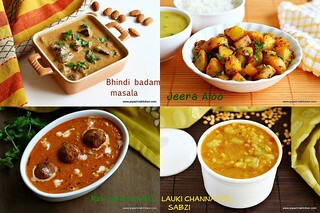 Urad dal can be replaced with channa dal too. You can add garlic while sauting to enhance the flavor. 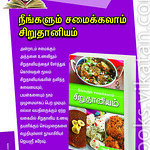 Curry leaves or coriander leaves can be added while grinding to give more taste. love the colour jayashri.... nice chutney..
nice click jeyashri esp in ramekins the some design on the chutney Wow :) one of my favourite ! we made it as a thokayal ! and have it with rice ! 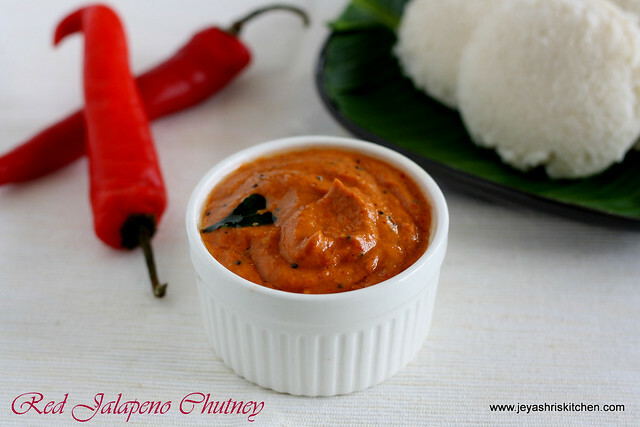 Spicy tangy chutney with lovely color.. 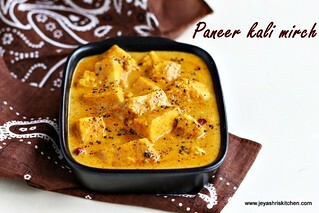 Sounds good..looks delicious..and should be wonderful with idli..
never knew those were called jalepenos!! 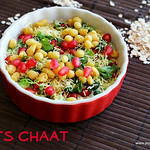 i thought they were just plain red chillies!........looks delish! 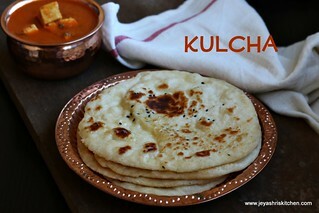 Sounds delicious..Love to taste this with Dosa! 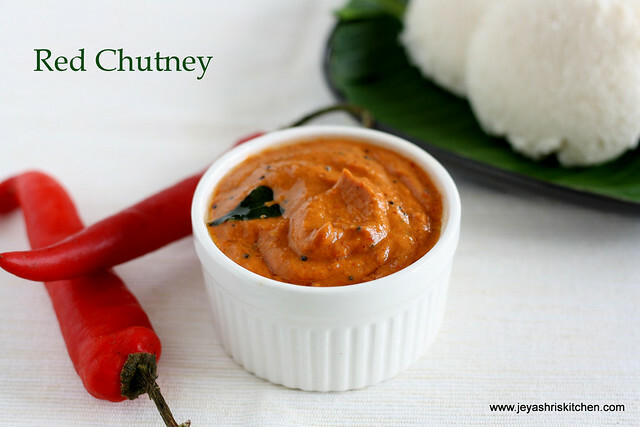 I love the chutneys that you make without coconut. This one will be made soon. I am sure it will be a hit too. 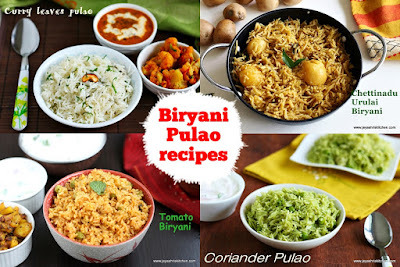 Wow.. lovely recipe.. looks awesome !! Beautiful color and looks so yum! 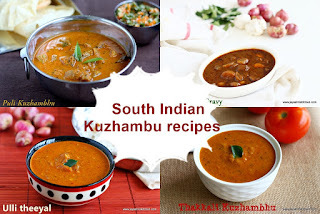 Very tempting with those idlis..
Lovely recipe , new to me.nice color..
look so delicious & like our tomato onion chutney.. hold try this next time..
That is such a gorgeous color! i bet it tastes amazing! 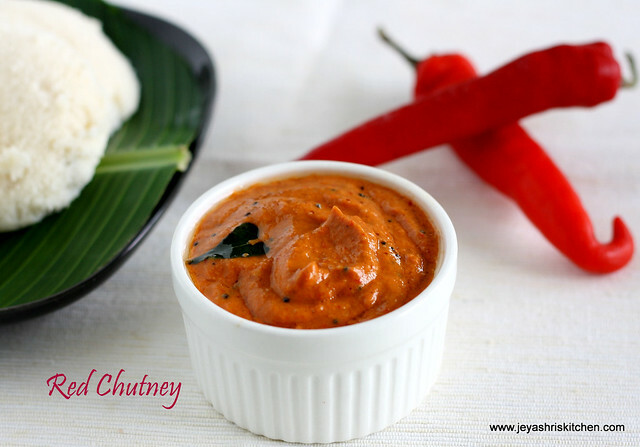 Irresistible chutney, wish to have it for my dinner tonite.